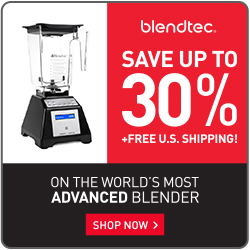 Blend to the End is a blog about preparing healthy, tasty, and simple food with high powered blending machines. Our goal is simple, provide valuable information that will you to enhance the way you use your blender. We first started using a Vitamix blender years ago to make green smoothies in an effort to eat a healthier breakfast. Years later, we continue to start the day off with a silky green smoothie. Not only have we lost weight, but energy levels have increased. We have since expanded to use the Vitamix to create hummus, peanut butter, soups, bread, and sauces. The purpose of this blog is to help others understand the versatility and power of these machines. We also want to help visitors decide whether they should buy a Ninja Blender, Blendtec Blender, or a Vitamix Blender. The blender product pages we put together will help you compare each model and allow you to determine which model is best for you! This blog started after we were talking to family and friends about the benefits of using the Vitamix. We thought it would be a great way to share the information learned while using this great machine. We certainly hope this blog inspires and motivates others to try new blender ideas. I hope you enjoy the blog and all of the information provided. If you have any comments or suggestions please don’t hesitate to comment or contact us. We hope others will blend to the end!